[description] => Syringomas are noncancerous growths of sweat glands. They often appear in clusters on eyelids but may also be found on chest, armpits and genital region. Most appear during puberty and in adulthood. Due to their harmless nature, syringomas can be treated at home. Find more information on causes, symptoms and treatments here. [category_description] => Syringomas are noncancerous growths of sweat glands. They often appear in clusters on eyelids but may also be found on chest, armpits and genital region. Most appear during puberty and in adulthood. 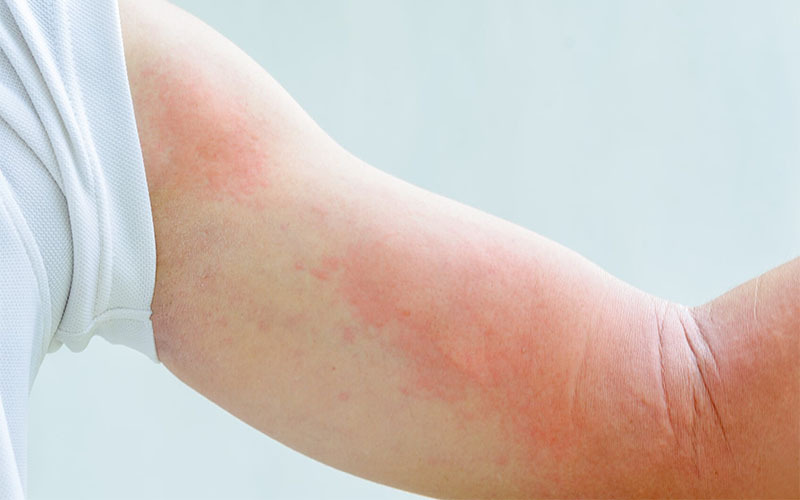 Due to their harmless nature, syringomas can be treated at home. Find more information on causes, symptoms and treatments here. [post_content] => You may be familiar with skin conditions such as skin tags, cold sores and razor bumps but you may not have heard of syringoma. Syringoma are basically non-cancerous bumps that mostly occur under the eye, on the upper cheeks and other parts of the body. These bumps are totally harmless. They will actually go away on their own even without treatment. For aesthetic reasons however, various treatment options can be sought. No specific age group or race is more predisposed to syringoma. They tend to occur more often in young adults just after puberty, however. 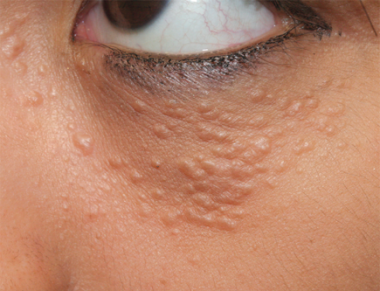 Syringoma bumps mainly occur in groups. They should not be confused with moles, warts, skin tags or even as one of the cold sores symptoms. There are photos online to illustrate all of these conditions, so you may want to check them out should doubt persist. What is chondroid syringoma and its symptoms? Before we get to the available treatment options, it is best that we first understand what syringoma is. Under the skin, one of the things to be found is sweat glands. These are the ones responsible for the production of sweat. It is around them that skin hair follicles originate. In some cases, these sweat glands may multiply prolifically. 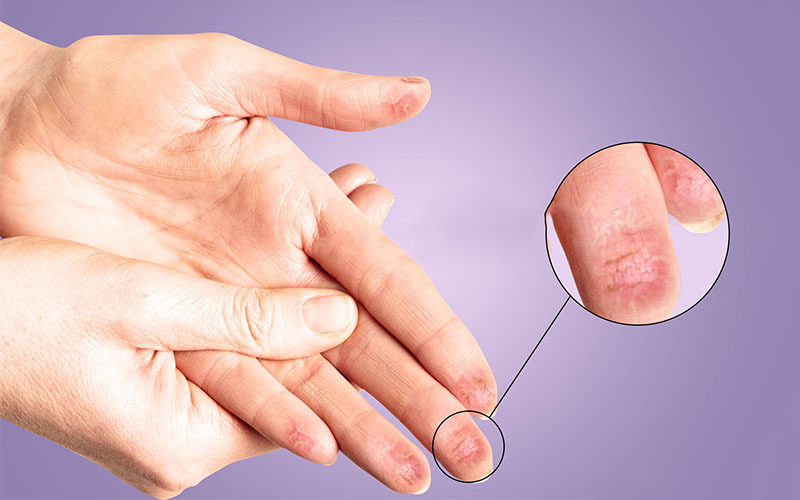 This leads to the formation of bumps underneath the skin which will appear as skin lesions. They average at 1 to 3 millimeters and are flesh colored or yellow in appearance. They sometimes will occur in clusters especially on the stomach or the chest. No pain or itch is felt from these bumps. Basically, that is what syringoma is. You can browse through available online photos for better understanding. There is also another rare condition known as chondroid syringoma. In this case, a tumor is formed from rapid multiplication of the epithelial cells. The condition is also benign. The problem is that tumors resulting from chondroid syringoma can develop to enormous sizes. In a certain study case, a tumor was found to have reached 15 cm in surface area. Which is the best syringoma cream for treatment? Unlike other skin disorders and home remedies such as castor oil for skin tags, over the counter and natural remedies are rarely used for syringoma treatment. In fact, it's hard to find a proven home remedy for syringoma removal. Surgical removal of syringoma is mostly the only available option. However, not all people are open to the idea of surgical operations. In this case, a syringoma cream can be tried. Syringoma can be treated with a cream effectively. The good thing is that you can actually buy such a cream over the counter and use it at you own convenience. 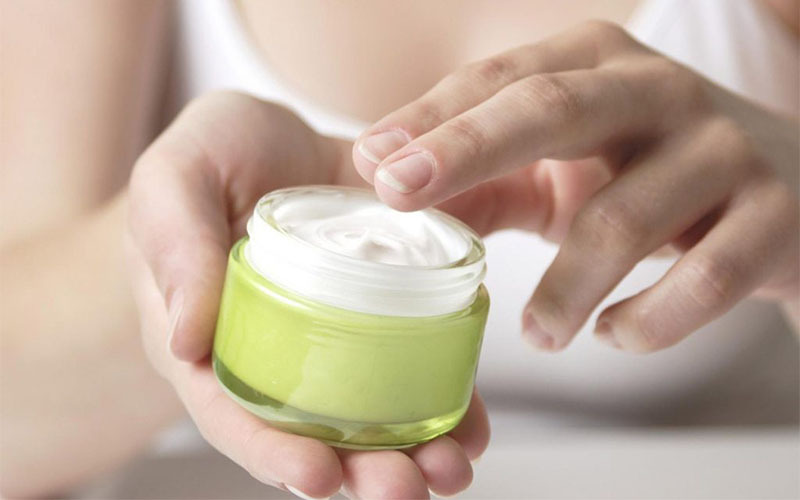 Some of the available creams contain ingredients such as lemon, cashew nuts and other herbal extracts. 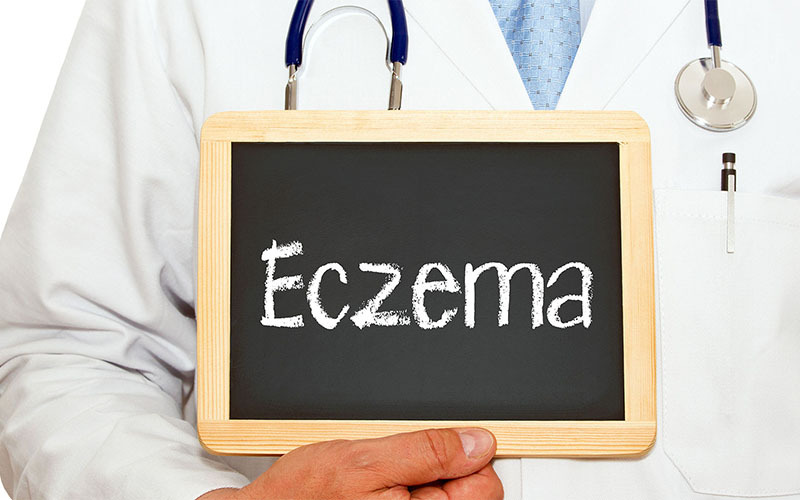 Rarely will you come across a cream specifically produced for syringoma removal. Most can also be used for other skin disorders such as red skin tags, moles, and non-genital warts. The best approach is to go through the available reviews for the best syringoma cream. To start with, find more about Nevi Skin, Nevexen and Wart & Mole Vanish cream brands. Here, liquid nitrogen will be used to reduce blood flow in the bumps by killing blood vessels. Liquid nitrogen is an extremely cold substance. It is used in treating various skin inflammatory conditions. Although an anesthetic is not usually necessary, you doctor may decide to use it. This treatment option involves burning the skin bumps with either heat or electricity. It is best done in a hospital although some kits are available that you can use. As mentioned earlier, scarring is likely to occur. A minor surgical operation can be done to remove the bumps. Here, a scalpel or a razor will be used to physically cut off the bumps. Like other treatment options in this list, surgical removal will leave a scar. This is a type of surgery that sees carbon dioxide injected in the prolific sweat gland cells. Depending on the depth of the surgery, it can cure syringoma. However, syringoma has been known to persist even after this surgery. 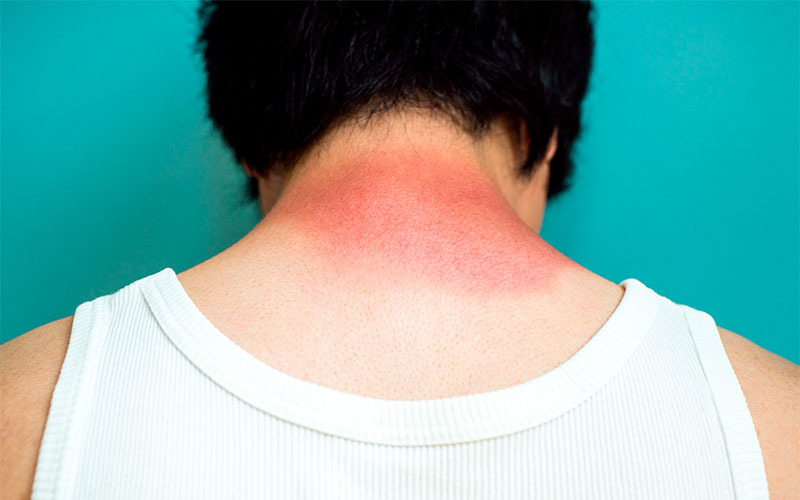 Using a cream or medical equipment, the syringoma lesions can be physically rubbed off. This is not very effective in multiple syringoma. You will certainly need to talk to your doctor about the best treatment option. Chances are that you will find a treatment procedure of more harm and expense than necessary. In any case, syringoma will not weaken your immune system or develop into cancer. Hereditary factors account for some syringoma cases. It has been estimated that 18% of all people with Down’s syndrome will develop syringoma. Other disorders that may contribute to this include Ehlers-Danlos and Marfan’s syndromes. In Asians and African Americans, eruptive syringoma is more persistent and common, although, as mentioned earlier, syringoma can occur in anyone regardless of their race or age. Women have also been observed to be more likely to develop syringoma than men. Sweat glands that are too active may end up in syringoma. Hormonal changes that occur in puberty may cause the condition. A skin biopsy may be essential if a syringoma diagnosis is uncertain. This of course needs to be done by a doctor, so you will have to visit a clinic. The infected part of the skin is numbed with an anesthesia. A sample piece from the skin will be removed. This can be done using a razor or a surgical scalpel. Depending on the procedure, a stitch may be necessary. The sample skin piece will be taken to the lab for a detailed examination under a microscope. If syringoma is identified, you will have the option of leaving the bumps on their own or going forward with one of the syringoma removal options available. Lemon juice is actually an ingredient present in some syringoma creams. 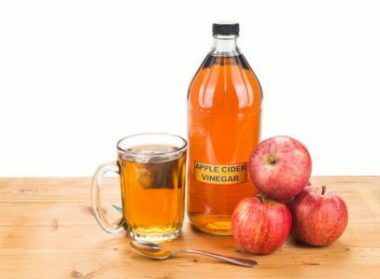 It supposedly works by burning the syringoma bumps through its acidic properties. Since it is a vitamin C source, it can improve on the scar left behind after treatment. This home remedy is popularly used in removing a wide range of skin disorders including razor bumps. It has both anti-inflammatory and anti-oxidant properties. When applied on syringoma, the remedy corrodes syringoma bumps. Both the natural gel gotten from the plant or over the counter processed gel should work. Apply it on the syringoma. It can also be used to treat a boil on neck or armpit. Just as others in this list, garlic is effective in treating simple skin disorders but is not an official removal home remedy for syringoma. You can make a paste out of it or just rub it on the bumps several times a day. Some online reviews claim that using castor oil with baking soda can help clear the skin of syringoma. A few drops added to baking soda are should be applied on the bumps twice a day for best results. Castor oil is also very effective when used to remove skin tags. It may be hard to actually tell if the home remedy you are using has worked or has been no better than a placebo. So you may want to compare before and after results to determine the effectiveness of such a remedy. Since diabetes patients have shown a tendency to develop syringoma, always ensure that you keep checking your blood sugar and blood pressure levels. Physical exercise will help you maintain good health, which is essential in normal operation of the body. Include healthy food products such as fruits and vegetables in your diet. You can also consider taking supplements that are rich in antioxidants and anti-inflammatory agents. By the same ticket, avoid drug abuse, especially smoking and excessive alcohol consumption. Ensure that you maintain personal hygiene. Also, don’t use untested skin products and creams. Lastly, don’t disturb or pick at syringoma bumps. Syringoma is a totally harmless skin condition. It is common in both men and women, especially just after puberty. Syringoma bumps are common on upper cheeks and under the eyes though they can also appear on other body parts such as the chest. Medical treatment, creams and unconfirmed home remedies are available for syringoma treatment. However, most of them are likely to leave scars once the bumps are gone. Depending on what you prefer, you may want to go ahead with removal or just let the syringoma heal on its own. Professionals will always advise you to check with your doctor, even with symptoms such as a canker sore in the throat. The fact is that although most such simple symptoms will end up proving to be of no health concern, they are potential indications of serious underlying health conditions. Additionally, you may also be encouraged to take general clinical tests which are very important. 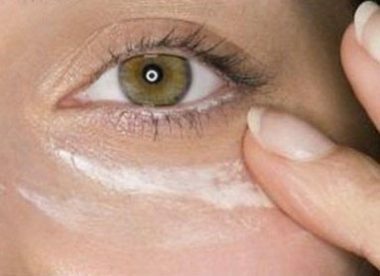 [post_title] => Syringoma Removal Cream and Treatment – A Detailed Guide on How to Avoid. Over 1 articles spanning numerous of Syringoma topics. Syringomas are noncancerous growths of sweat glands. They often appear in clusters on eyelids but may also be found on chest, armpits and genital region. Most appear during puberty and in adulthood. Due to their harmless nature, syringomas can be treated at home. Find more information on causes, symptoms and treatments here. Syringoma Removal Cream and Treatment – A Detailed Guide on How to Avoid.